Whitehall Road Power Station, circulating pump house. In 1899 and 1900 these two Belliss & Morcom triple expansion steam engines were installed in the power station to direct drive 2 phase alternators (yes 2 phase). 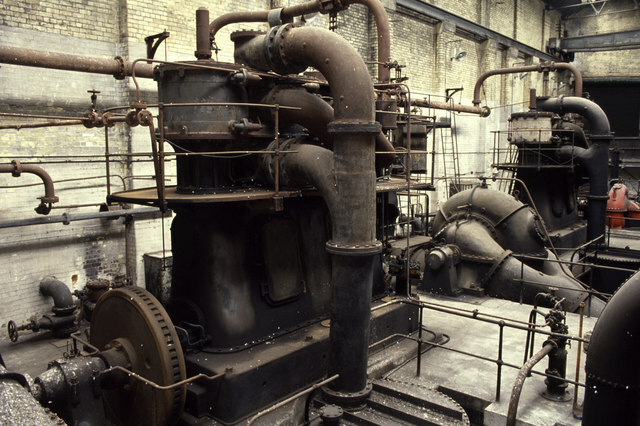 When the power station was upgraded with turbo-alternators the redundant reciprocating engines were coupled to centrifugal pumps and used to circulate water from the Aire through the condensers of the T/A sets. They were maintained in standby condition until 1974 and were removed for preservation in 1992. Unfortunately they were ultimately scrapped along with other important engines, having never been reassembled or put on display. Their fate is typical of that befalling the early days of electricity generation in the UK. Nearly al the older items were long since scrapped and more modern plant is just too big to be preserved. Thus one of our important industries has little to show for its earlier prime movers. It's one thing to save meters and switch gear but something else to save larger engines or turbines. The best representation of an earlier power station is to be found at Claymills Victorian pumping Station in Burton upon Trent - SK2625 : Claymills Victorian Pumping Station - dynamo house SK2625 : Claymills Victorian Pumping station - dynamo house. This page has been viewed about 1071 times. · Markham Grange, museum in the making. Re the statue of the Black Prince (in the City Square near the station), it used to be said that he'd been placed here, pointing South to tell all the southerners who've just got off the train to b****r off back down south!